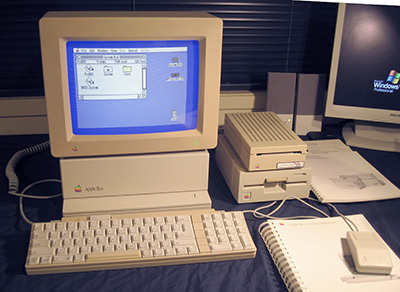 The date was 1986 and despite IBM's entry into the marketplace, the venerable Apple II line was still profitable for Apple Computers, having found favour in schools and the higher-end hobbyist market. However, steady sales couldn't disguise the fact the technology was aging. Its glamourous cousin, the Macintosh, was getting all the press attention so maybe it was time to look again at what could be done with Woz's old workhorse. One thing the company didn't want to do was to drop all Apple II-type computers. There was a sea of software for the Apple II/II+/IIe machines, loyal hobbyists loved the open architecture and the line had brand history, all things the Macintosh lacked at that time. Why not meet the Mac halfway? Build a machine that could run a modern, Mac-like interface, yet remain almost 100% compatible with all that old Apple II software and those third party cards. People could trade up from older Apple IIs and others could buy the machine knowing plenty of programs were available. Enter the Apple IIGS (Graphics and Sound). Based on the WDC 65C816 microprocessor running at 2.8 MHz, the machine sported a crisp RGB screen, up to 1MB of RAM, had a new Mac-like keyboard and mouse, and contained a number of interfaces which in earlier machines required separate cards. Furthermore it could use the newer, smaller 3.5 inch drives with ease and ran a Mac-like GUI called GS/OS which took advantage of the new graphic modes and sound features available. Despite all this bling you could still pop the top and install whatever Apple II card took your fancy, and it ran all that Apple II/II+/IIe software even off 5.25 inch disks if you wanted! I got this version ROM 3 machine in parts. Most of the components I acquired in 2007 when I was given a full machine only to discover battery acid had eaten the mainboard. I've finally sourced a replacement 5 years later! Parts of it are yellowed as you can see, so it's earmarked for the Retr0Bright treatment at some stage. My impressions? Great! It has a small footprint and feels reliable and solid. Apple II programs look WAY better on the RGB screen than the old Apple IIe Color Monitor and GS/OS works well. Actually this computer has more than meets the eye. Under the hood I've placed some 2012 technology. A CFFA3000 card! The IIGS is not a classic machine as such but as the model at the end of the Apple II line, it deserves some time in the spotlight. Certainly as an upgrade to the Apple II+ or IIe for all those Apple II nutters out there, it couldn't have been better!